Theresa May has urged an independent inquiry into violence on the border between Israel and Gaza which left a reported 58 Palestinians dead. The prime minister said the use of live rounds by Israeli forces was "deeply troubling" and urged greater restraint. While Palestinians had a legitimate right to protest, she said, she was concerned about extremist infiltration and the role Hamas had played. Earlier, Labour's Emily Thornberry condemned a "horrific massacre". Funerals are being held for the people killed when Israeli troops opened fire during Palestinian protests. At a press conference in No 10 following talks with Turkish President Recep Tayyip Erdogan, Mrs May said the events were "destructive" to attempts for a lasting peace, and an inquiry into what happened was paramount. While Israel had a right to defend its borders, she said "the use of live fire and the resultant loss of life is deeply troubling... It is in everyone's interest for peace to prevail in Israel and the Occupied Territories". During an urgent question in the House of Commons, several MPs asked about UK arms sales to Israel and criticised the United States' decision to move its embassy to Jerusalem, a move opposed by the UK. As well as calling for restraint from Israel, the UK government said peaceful protests in Gaza were "exploited by extremists". Monday's protests were timed to mark the anniversary of Israel's creation in 1948 and the hundreds of thousands of Palestinians who subsequently fled their homes or were displaced in the war that followed. Israel said some 40,000 Palestinians had taken part in "violent riots" at 13 locations near Israel's security fence along Gaza's eastern border. But Ms Thornberry said Monday's events were the result of "an apparently calculated and deliberate policy to kill and maim unarmed protesters, who posed no threat to the forces on the Gaza border. "Many of them, shot in the back. Many of them, shot hundreds of metres from the border, and many of them, children." Ms Thornberry told MPs action was needed "to stop this vicious slaughter". 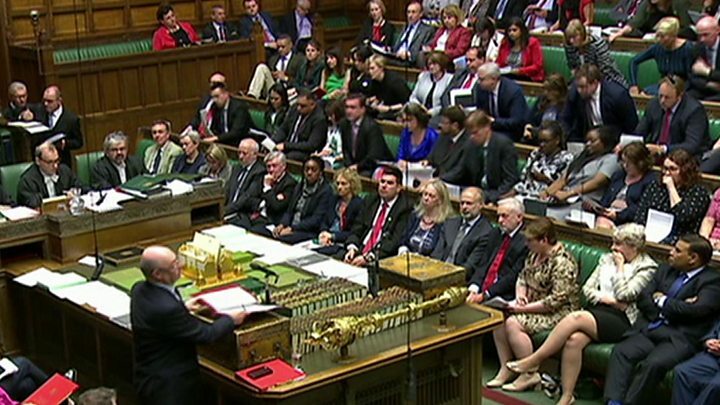 In the Commons, Foreign Office Minister Alistair Burt said the violence should be used as "an opportunity for a springboard to peace". "We have no side here, except with the victims," he said, calling for an investigation into why so much live ammunition was used. He also asked why Ms Thornberry had not mentioned "any possible complicit involvement of Hamas", Gaza's Islamist rulers, blamed by Israel for the violence. "There must be a political solution," he added. Veteran Conservative MP Sir Nicholas Soames urged the UK to have a "less limp" response. The SNP's Stephen Gethins said the US decision to move its embassy in Israel to Jerusalem was "reckless and irresponsible" and asked if ministers agreed it had "stoked tensions" there. In response, Mr Burt said the move "was not supported by the UK", was "not conducive to peace in the region" and its timing was "extremely difficult". 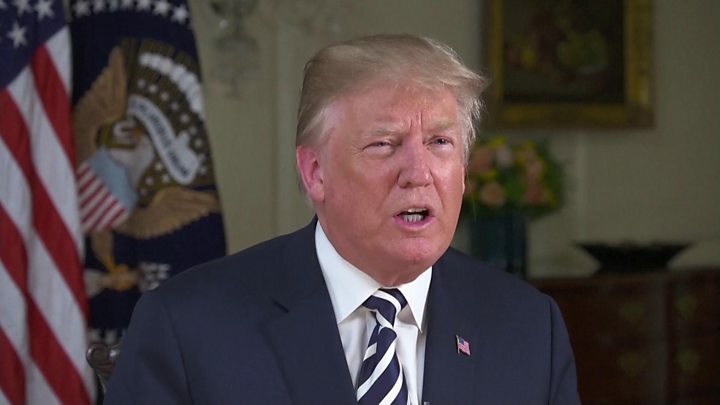 He also said the US should have "a greater sense of understanding of some of the underlying issues" behind the Israeli-Palestinian conflict. Liberal Democrat MP Layla Moran, who is of Palestinian descent, said the two sides were not meeting as equals and urged recognition of a Palestinian state by the UK. Mr Burt said the question of recognition "remains open" but needed to happen "at a time when it's most designed to serve the cause of peace". Palestinians were demonstrating on Monday as they have been for seven weeks, as part of a protest orchestrated in part by Hamas and branded the "Great March of Return". Palestinians hurled stones and incendiary devices and approached the border fence. Israeli snipers fired live ammunition at protesters and used tear gas dispersed from drones. Israeli Prime Minister Benjamin Netanyahu sought to justify the military action. "Every country has an obligation to defend its borders," he said. 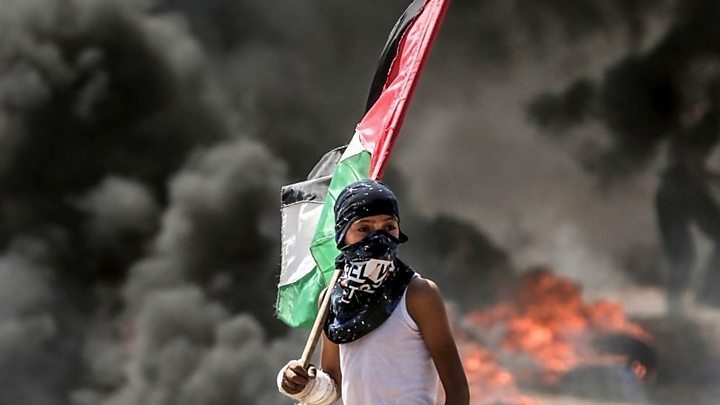 Hamas did not initiate the weekly protests that have been taking place for the past seven weeks but the group has since become the driving force. At the end of March, the Hamas leader in Gaza, Yahya Sinwar, said the demonstrations were aimed at removing the "transient border" with Israel. Hamas has called for Israel's destruction and is in a permanent state of conflict with the Jewish state. Why is the embassy so controversial? The violence in Gaza and the US embassy opening were not explicitly linked but both were timed to coincide with Israel's 70th anniversary on Monday. Commentators drew attention to the stark contrast between the images from Jerusalem - of a high-level US delegation, alongside Mr Netanyahu and his wife, celebrating the new US embassy opening - and the violent images emerging from Gaza. The relocation breaks with decades of US policy and has incensed Palestinians and other nations, who say it violates international law. Palestinians claim East Jerusalem as the capital of a future Palestinian state, and see the US move as backing Israeli control over the whole of the city. The Palestinian president, Mahmoud Abbas, called the new embassy "a US settlement in East Jerusalem". The Gaza Strip is a narrow piece of land along the Mediterranean coast between Israel and Egypt, about 40km (25 miles) long and 10km wide. It is home to about 1.8 million Palestinians, making it the third most densely populated place in the world. The shape of the strip was defined by ceasefire lines with Egypt at the end of the 1948-49 Arab-Israeli war. Egypt administered Gaza for the next 19 years but Israel occupied it in the 1967 Arab-Israel war. It withdrew its forces and settlers in 2005 but the UN still considers the territory occupied because Israel retains control over the territory's air space, coastal waters and shared border. Politically, Gaza is controlled by Hamas, which Israel and other powers regard as a terrorist group. Since 2007, Israel and Egypt have enforced a sea and air blockade, controlling the flow of commercial goods and people in and out of the strip. They say it is for their own security. The Gaza Strip is impoverished and the UN has warned it is on the verge of total collapse. In 2014, a 50-day war between Israel and militants in Gaza killed 2,251 Palestinians, including 1,462 civilians. On the Israeli side, 67 soldiers and six civilians died.